Packing up Birthday goodies for a special someone! 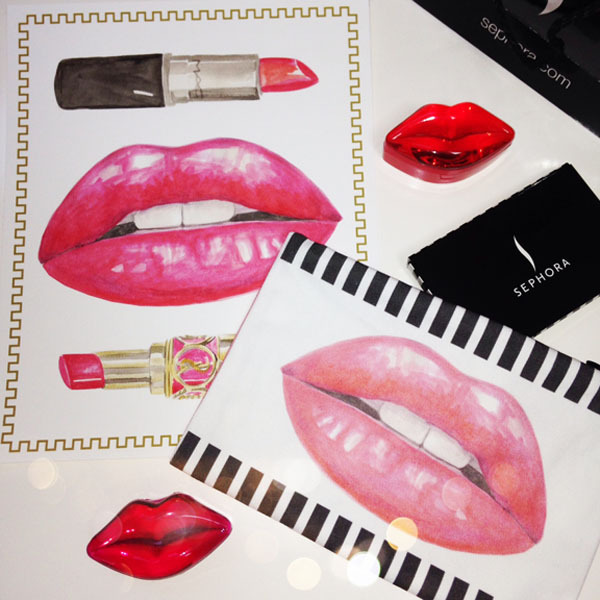 Just Love how perfectly a Sephora gift card slips into our Lipstick Bag & coordinates with our Kiss Me Art Print. Happy Friday eveyone! 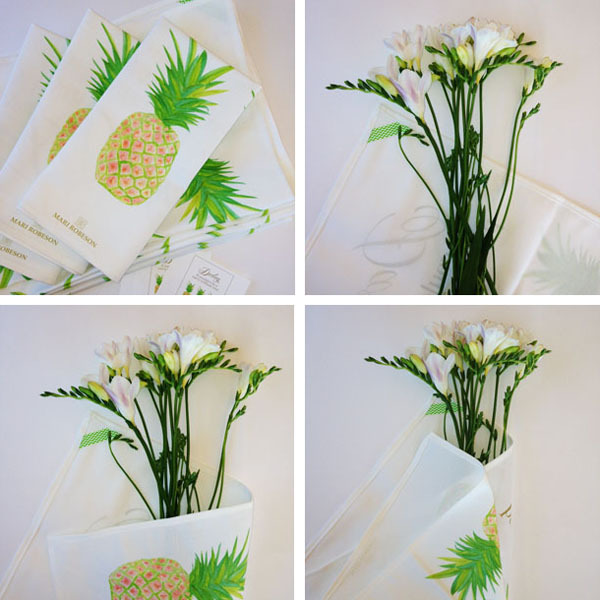 Lately I've had the pleasure to work with a really lovely designer-blogger! Jennifer from The Pink Pagoda & I have been collaborating on a fun little project we will be sharing with you this week! Jennifer had some wonderful ideas that she had asked me to illustrate for her website. It was so much fun that I had to make a sister painting for my own Shop. Meet Juliette! She is part of my new Cabanna Collection. She plays very nicely with my New Zebra Pillows too! Oh So Safari Chic! Make sure to back this week to see what we've come up with tgether! A Little Safari Chic To Kick Off Your Summer! So excited about these new designs! I've been dreaming in Pink & Blue! Available in my Shop this week! -AND- Stay tuned for June's Free Wall Paper I designed for the The Pink Pagoda and YOU!!!! Love The Guncles & Their Daughter's Beautiful "Beverly Hill's Hotel Inspired" Bedroom! I met Bill Horn & Scout Masterson, aka The Guncles, last October and they were the nicest couple! Bill was so excited about their "Beverly Hills Hotel Inspired" room they were designing for their adorable daughter. He was so sweet & genuinely appeared to love my Bow Pillow so I asked if I could send them one. I never imagined it would end up in such a beautiful space! AND how generous and lovely of them to give me a shout out in their article & feature on Project Nursery! Make sure you check out their inspiring design story and all the beautiful room pictures (including this one which is from the article) on Project Nursery here! Happy New Year's Eve! It sounds like from what I'm reading on everyones blogs that 2013 was a pretty good year! It was for me as well and I'm deeply grateful for that. I'm also very thankful for all the amazing new relationships and friendships that have come my way in 2013. My word for 2014 is "Collaboration". I hope to meet even more wonderful people to work and play with! Tonight, in between driving kiddos to their parties, we plan on staying home and ringing in the New Year with a few close friends, some delicious eats, and of course, a little Champs! I'm excited to try this Pineapple-Ginger Sparkling Champagne cocktail tonight! I found the recipe here. One of my wonderful clients gave me this fabulous Chronic Cellars champagne. They are a local winery in my area and I've been wanting to try them! I hope you have a wonderful evening and may this new year bring us all great health, joy and prosperity! Be sure to check back tomorrow morning for a Fantastic Free way to start your New Year! I love social media! Through it, this year alone, I have met more than a dozen amazing entrepreneurs, shop owners, and artisans all who have become good friends. How terrific is that? I came across Raquel from Horses & Heels via her beautiful Pinterest boards. After a quick correspondance we've already worked up a little idea that I can't wait to share with you this January! Today, she really surprized me though and did the sweetest Blog Post on my New Equestrian Collection now available in my Shop! Really wonderful, kind and generous people do exist people and Raquel is at the top of the list!!! Please enjoy checking out her Website and Facebook and Twitter! Mid-Week Mood Board - Hello Darling! Maybe it's because I have three daughters or maybe it's because a beautiful bow just has a way of making me smile. Today's Mood Board is all about Bows! Introducing my New Hello Darling Collection! Something really special and sweet happened this week. My new friend Karen from gLaM-a-peeL made this gorgeous coral headboard decal to specifically match my new Hello Darling pillow! It's truly the Inspiration behind today's watercolor! You can find these goodies and many more of Glam-A-Peel's yummy decals over at District17.com! Monday's Mood Board - Introducing Modern Glam! It's impossible to live with three teenage daughters and not be surrounded by glitter and make up! My girls have inspired my latest collection, Modern Glam! 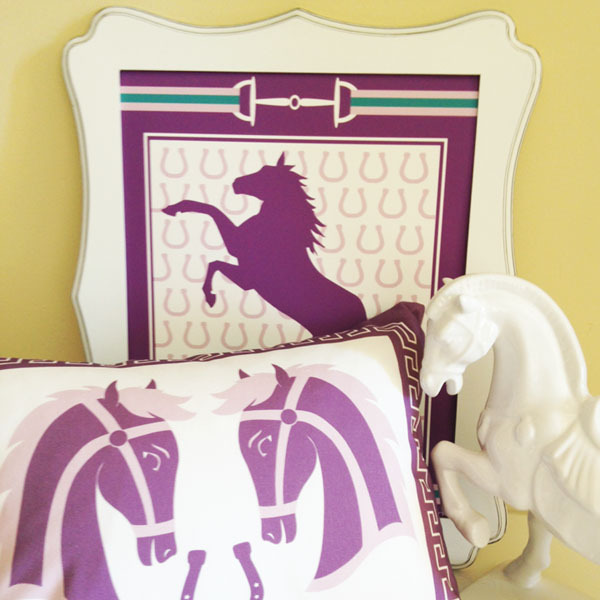 New pillows and prints that reflect a vintage and timeless feeling on fashion and home decor. I love old black and white movies portraying glamorous women living in a time when fashion and decor was so stunning! Those movies definitely influence my style in Interior Design. So when I found this gorgeous Tear Drop Mirror and Black Glass Desk from ShopTen25, I was inspired to put together this Monday's Mood Board on Modern Glamour! Enjoy! We LOVE This Mood Board By gLaM-a-peel! Funny, I'm painting flamingos right now because I certainly feel like I've had my head burried in the sand, working away like crazy in my studio on all kinds of new designs. Just when you think, all work and no play makes you feel like you're not getting anywhere, you get a really delightful surprise from another designer! Just yet another room design going over here at the studio. This one is a room for an aspiring fashion designer. I painted this little lovely today inspired by all the gorgeous models in the world! She is now a new print and pillow coming soon! My projects have now overflowed onto my dining room table and with a big graduation party comng up, it's time to get organized!! Eeeek! This week I worked on a design I'm calling my Parasol Room. It's pinks and blues and I'm pleased with how it's all coming together so far. I painted these yesterday but I'm still not quite sure if they will be fabric or pillows or prints And I still have a few more ideas swirling around....soooo stay tuned... Have a great weekend everyone! Thank You For The ETSY Love! What a nice surprise to wake up today and see our Yellow Chevron pillow features on not one, but two, lovely Treasuries! Thank You Sienna Grace & Thank You Rotton Rooster! Our Yellow Chevron Pillow shown here with our ELovephant & Pink Chaz pillows. All available at Piccola Casa! I hope everyone has a very safe and fun holiday weekend! I'm working on some new art today and thought I'd share a little "behind the scenes" images. I think I'm going to use these repeats as the background to another watercolor painting and layer them in Photoshop. We shall see how it evolves! Hello! I'm excited to share! Our New 2013 Catlog is now Live on Issuu! Just click on the cover to read! Thank you for your wonderful support!!! Click here to view! Monday's Mood Board - Introducing "Bows & Ballet!" This week I'll be putting the finishing touches on our New 2013 Catalog and today I'm introducing a new collection; Bows & Ballet! Many of you may not know this about me but I've been a dancer my entire life. During my early twenties I actually danced professionally and loved every minute of it. I've taught dance for over 25 years but sadly, I haven't been dancing at all this year. I was doing a little cleaning up and came across my old dance shoes and leg warmers and the inspiration hit. That couple with everything striped trending right now, it's the strangest things that can inspire me sometimes. My new little petite pillow is 12" x 12" and I just love how it's such a sweet little accent to any room. I also love the graphic feel of the art pieces grouped together with these laser cut monogrammed letters from Rosenberry Rooms. So clever! This stunning resting bench is from Layla Grace. I would love to have it in my home! Of course, I think every young ladies room should have a manikin. In my daughter's room we have "LoLa". She is fabulous at keeping track of jewelry, belts, and scarves. I used to have her in my boutique but now she has a lovely home with my girls. Happy Monday All! Let's all have an amazing week! Our Macaroon Tea Towels Are Now On Sale! Get Them While You Can! The Tea Towel has quite the background. In the early nineteenth century the Tea Towel was used in England for the proper service of tea. The Victorian Ladies would often personalize their Tea Towels with embroidery and use them during Tea Time to cover food, take care of any spills, and later to polish silver or clean their delicate china. Although the dish towel of today certainly handles most of our everyday clean up, I still have a passion for the Tea Towel. I've collected many over the years and I use them for everything from lining a service tray to wrapping them around a bottle of wine as a hostess gift. So this year I was inspired to create my own. My Macaroon Calendar Tea Towel has had some lovely press lately and I appreciate all the lovely comments from those of you who have purchased one or two or three! But it's February already and I want you all to enjoy them even more so I AM HAVING A SALE!!! They are now 40% Off and available here! 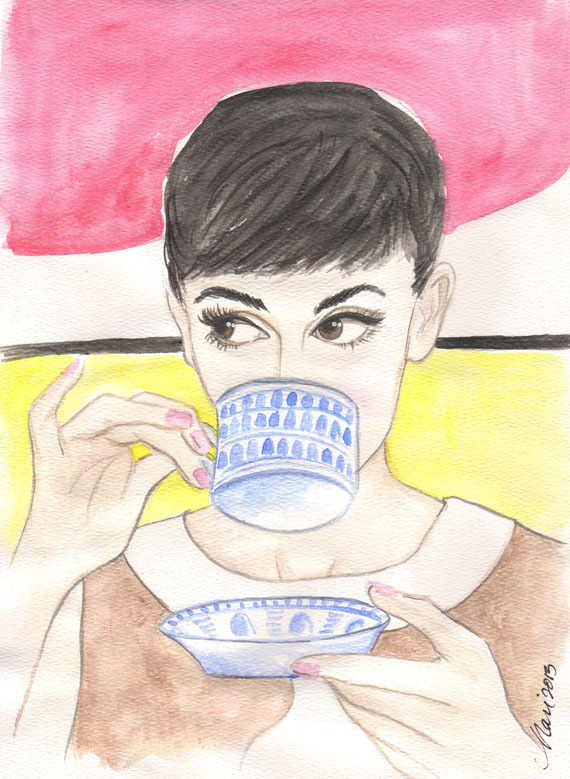 Inspired by Tea and the beautiful Audrey Hepburn...today's mix on my Monday Mood Board!